WASHINGTON --The most powerful earthquake to hit Mexico in 100 years rattled residents in Mexico City early Friday morning, with several saying that they relived what felt like the same deadly earthquake that struck almost exactly 32 years ago and took 10,000 lives. This earthquake struck just before 1 a.m. Friday, waking many and sending people running into the streets from their homes. 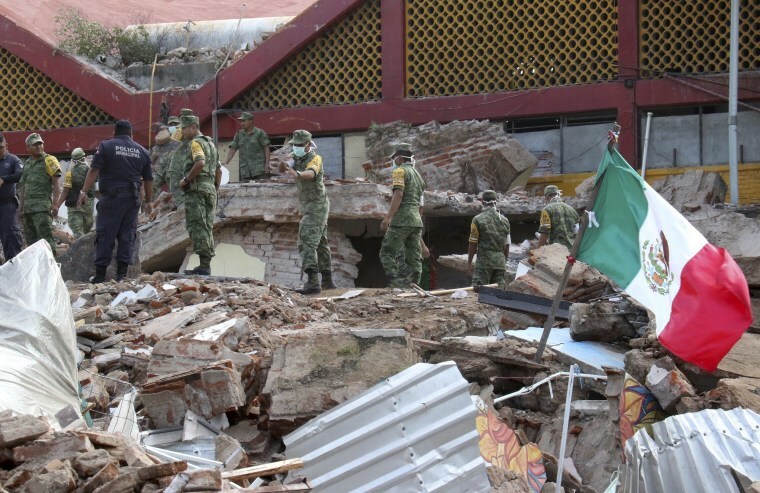 At least 26 people in other parts of Mexico had been reported killed as of Friday afternoon. “Oh my God it reminded me so, so much of 1985. I felt like I was back there again. It was a tremendous scare, very frightening,” Mexico City housewife María Cristina Coutiño Covarrubias told NBC News. In the hours after the magnitude 8.2 quake struck some 450 miles from the capital off the Pacific coast, Mexican seismologists had reported at least 130 minor aftershocks, and officials were telling residents that a “significant” aftershock could also be expected. While the temblor was stronger than in 1985, officials said so far there are fewer deaths than the mid-September earthquake of 32 years ago, likely because Friday's quake struck further away from the country’s populous capital city. Laura Castellanos Saavedra, a writer living on the first floor of a three-story apartment building in Mexico City, told NBC News the ground felt “spongy” and her building felt as it it was about to collapse. While the quake unnerved many in the city, knocked windows out and caused some walls to collapse, the damage was far more severe in the southern states of Chiapas and Oaxaca where there are reports of deaths and collapsed structures. The earthquake caused some swaying of Mexico City's famous landmark, the Angel of Independence monument, but as a resident noted on Twitter, the monument was well secured years ago.